Morgan Paige drives toward the net. Paige scored Butler’s fourth goal in the loss to Temple. Photo by Jimmy Lafakis. 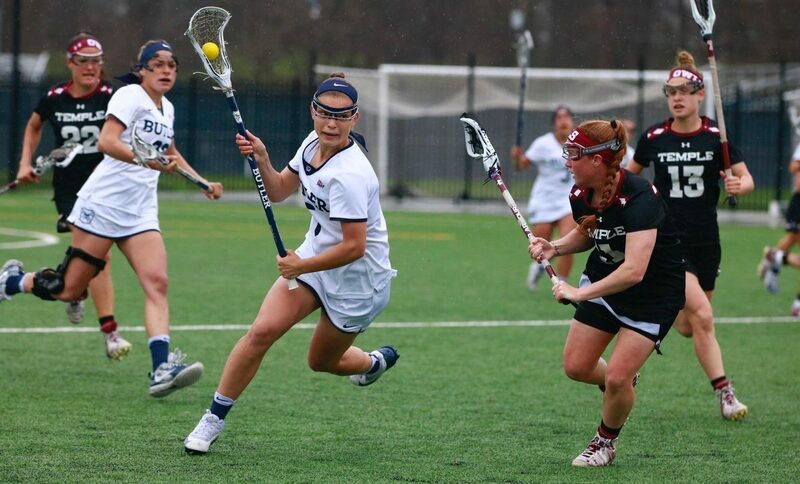 The Butler University women’s lacrosse team fell 18-5 to Big East foe Temple University on April 14. The match was originally scheduled for noon, but was pushed up two hours due to weather. Butler led 3-2 early in the match after two goals from redshirt junior midfielder Haley Hallenbeck and one from sophomore midfielder Ashley Lizzi. Temple answered with a 5-0 run, but freshman attacker Morgan Paige found the back of the net on a free position attempt. Temple tallied 11 straight goals in the second half before freshman midfielder Isabella Mandli scored with 15 seconds left in the game. Butler recorded 14 saves in the match, 12 of which came in the first half. Butler committed 25 turnovers in the match and registered eight shots on goal. Temple recorded 32 shots on goal. The Bulldogs will face Villanova University on April 18. The opening face-off is scheduled for 12:30 p.m.